Relay shield for Arduino. This shield makes it easy to switch high current loads, both AC and DC. This Arduino shield comes fully assembled with 4 relays on board. Each relay is rated at 3 Amps, 120VAC / 24VDC. Also includes an xbee socket for use with wireless xbee modules. Switch devices on/off remotely! // Don't load this sketch, then go on a 2 week vacation! See the relay datasheet here. 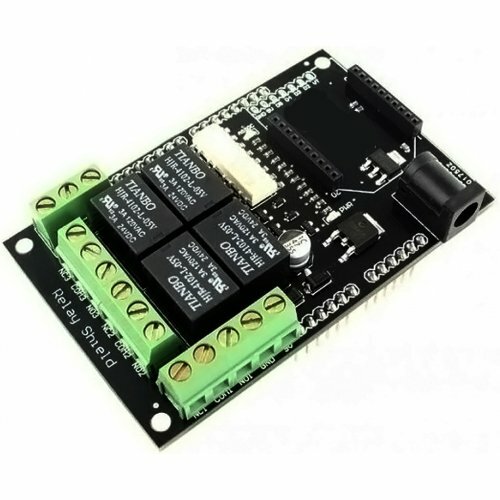 See the Relay Shield for Arduino schematic here. This shield comes fully assembled, and ships from the USA.